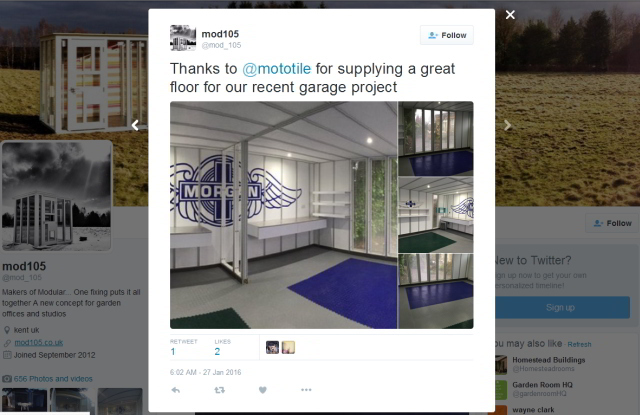 A quick message to thank you for looking after us when we purchased our new mototile floor. It is now finished … here are some pictures of what it looks like after several weeks of Scouting use (a pretty good test!) It ticks all the boxes – easy to keep clean, durable, not slippery … And our young people particularly liked the colour-coded corners! Mototiles look fantastic… Thank you Sam! 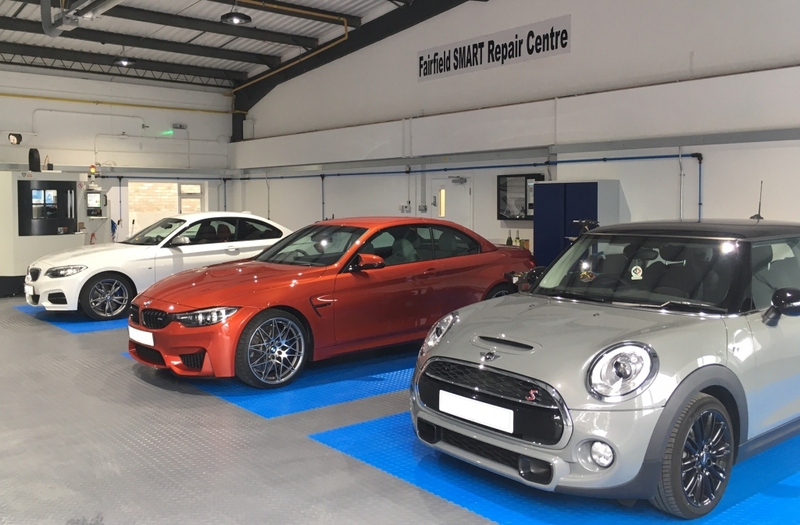 Fairfield BMW, Leigh-on-Sea have marked out service bay areas on their new floor using Motolock tiles in Electric Blue against a Dark Grey tile background. 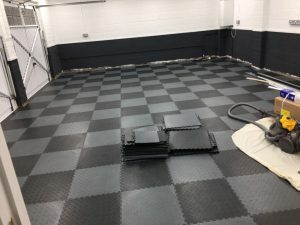 An advantage of interlocking tiles over other flooring methods here is that the bays can be moved or resized fairly easily by moving tiles around. Try that with paint. The floor is now complete. Please find some images attached. Mototile is at the Goodwood Festival of Speed 2017 which runs from Thursday 29th June until Sunday 2nd July 2017. 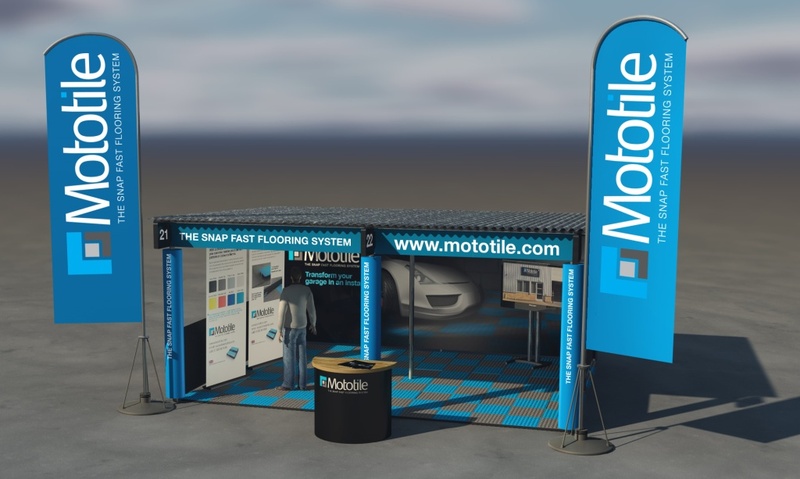 You’re welcome to drop in on Mototile at Stand 125 and take a look at Mototile Products. 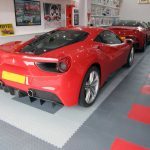 Flooring for Ferraris and a Fuzzy Fizzy? Large floor in Platinum Grey Mototile Seamless tiles. 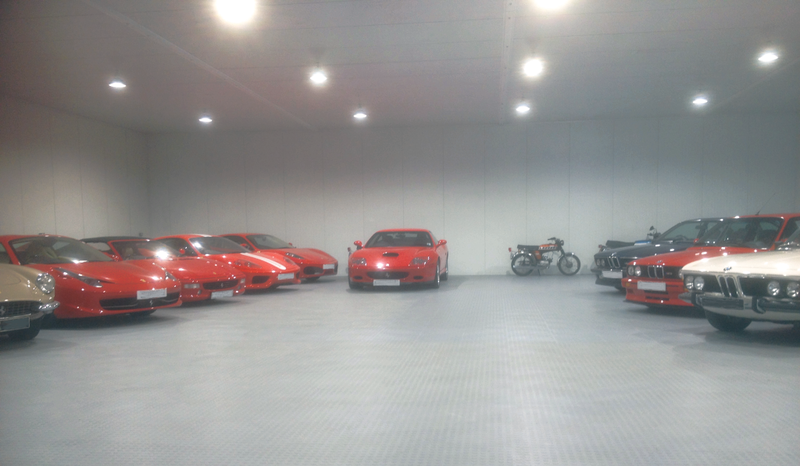 Home to a small host of Ferraris, BMWs and is that a ‘Fizzy’, Yamaha FS1-E, I can see at the back there – the blown-up image is a bit fuzzy? Fancy a Night on the Tiles? 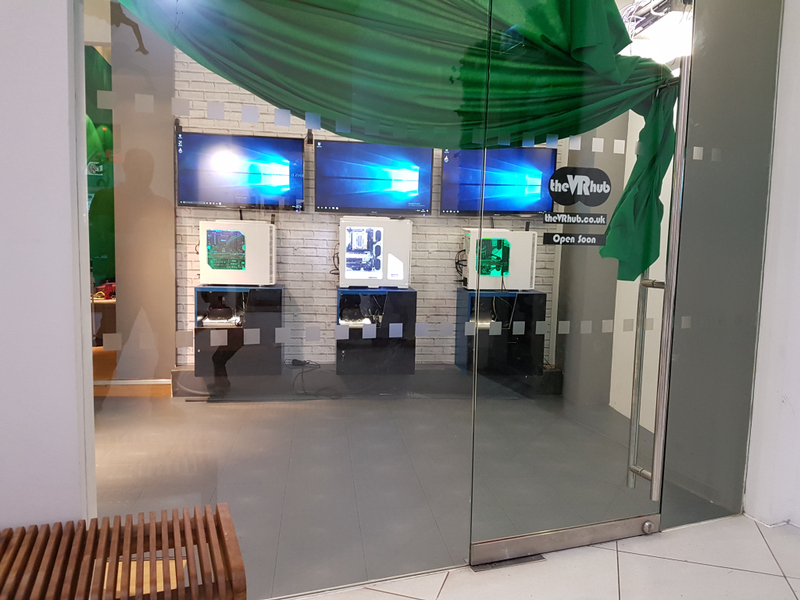 Advance preview of VR Hub – a Birmingham based virtual reality gaming facility. 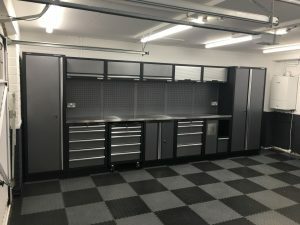 Pics of our install. Will send an update once we finish the LED lighting. 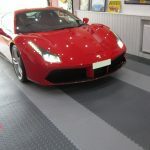 Floor tiles used are Mototile Seamless Grey Cointop (aka Pennytop). 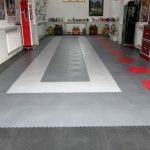 A novel fisheye lens view of a new Mototile Floor using Motolock tiles. OK not that Stig but a Stig. 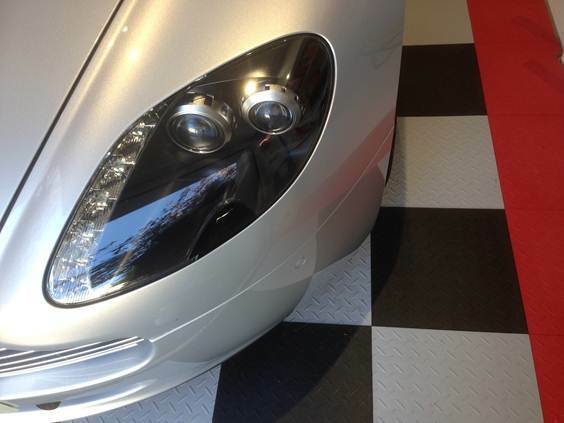 Tiles used were Mototile Seamless with Diamonplate pattern face. …. thought i’d send some pictures. Still need to add skirting board though. 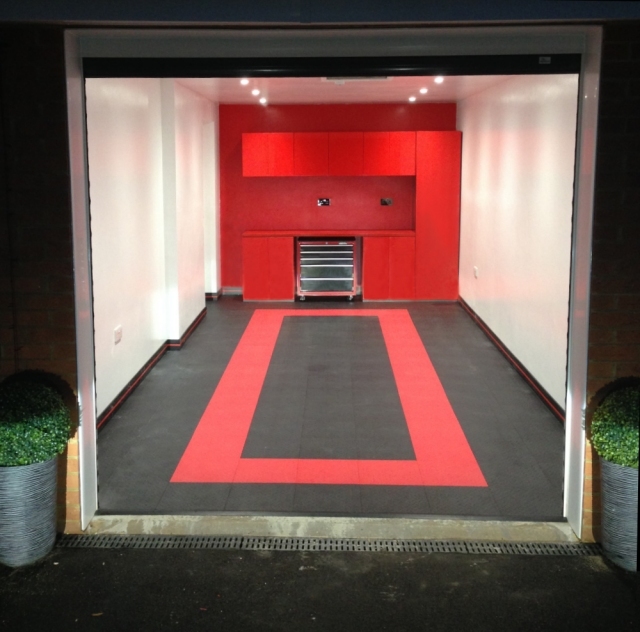 Red Floor by Night – Customer’s Delight. 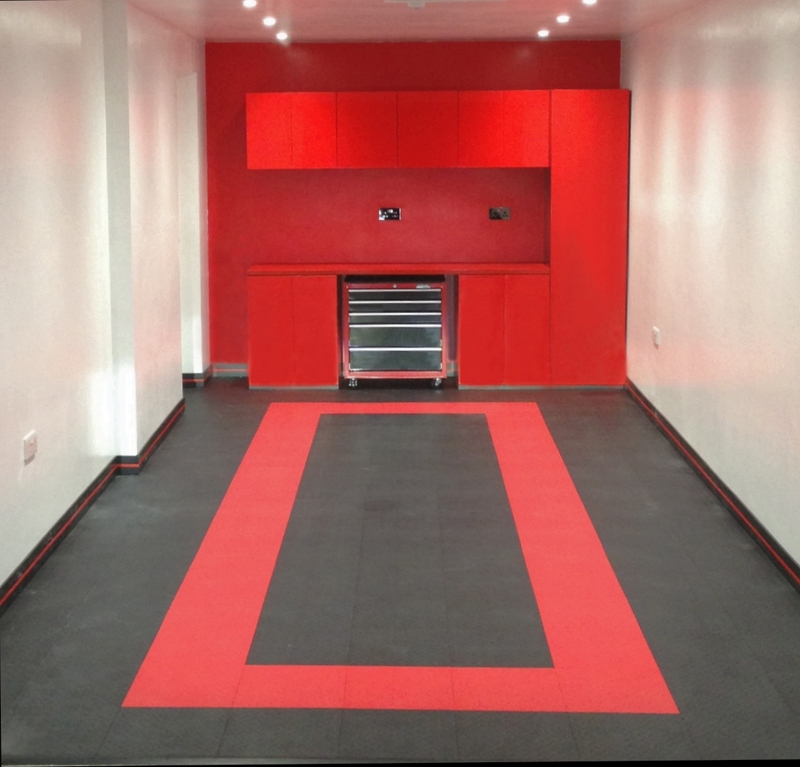 A bold design with clean lines and some thoughtful details from Steve – who’s finished his floor just in time for Xmas. 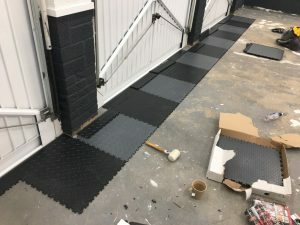 I have to say the moto-tiles and skirting had been an absolute doddle to install and the end results are just fantastic! 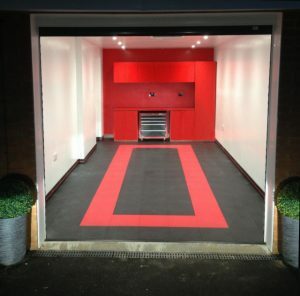 … it came out even better than I imagined, and the skirting in particular transformed the garage. 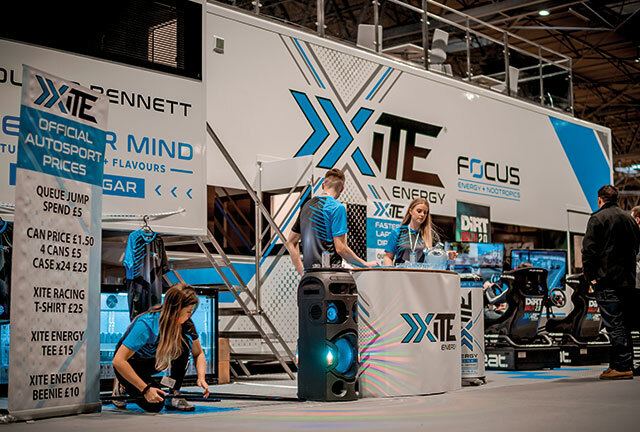 Once again thank you … I love your product, and the engagement with your company from start to finish was simply brilliant ! Tiles used were Mototile Seamless (Diamondplate pattern) and Mototile Skirting with customer selected red inserts to match the floor design. This garage had me floored 🙄 even before the new floor was laid. 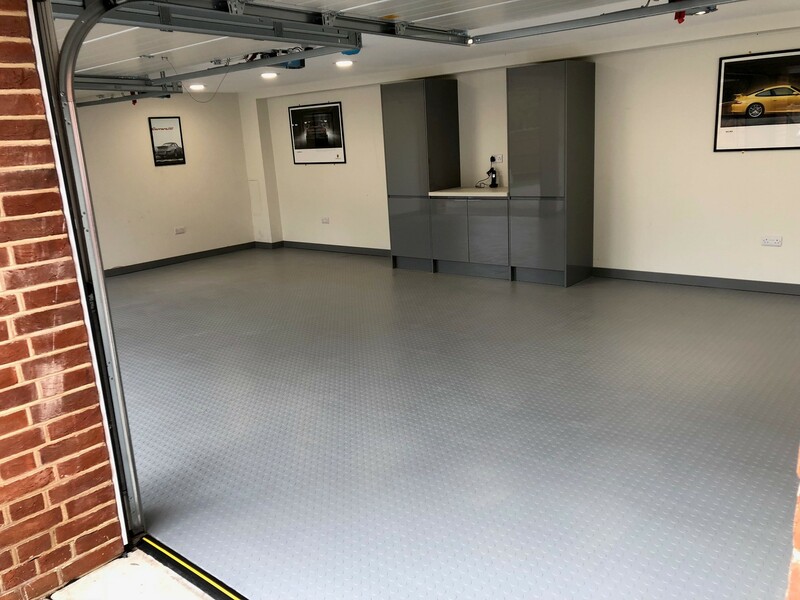 Taking advantage of the fact that interlocking tiles can be moved around relatively easily, various layouts were tried on-site for this garage floor to find the ideal colour combinations. Going the extra mile Mototile supplied layout drawings and tiles for the various options and the customers supplied some pix. Just finished the garage floor I think it looks great and I am well pleased, especially the design: just got skirting to do. Thought you might like to see some pictures which I attach if you want to use them. 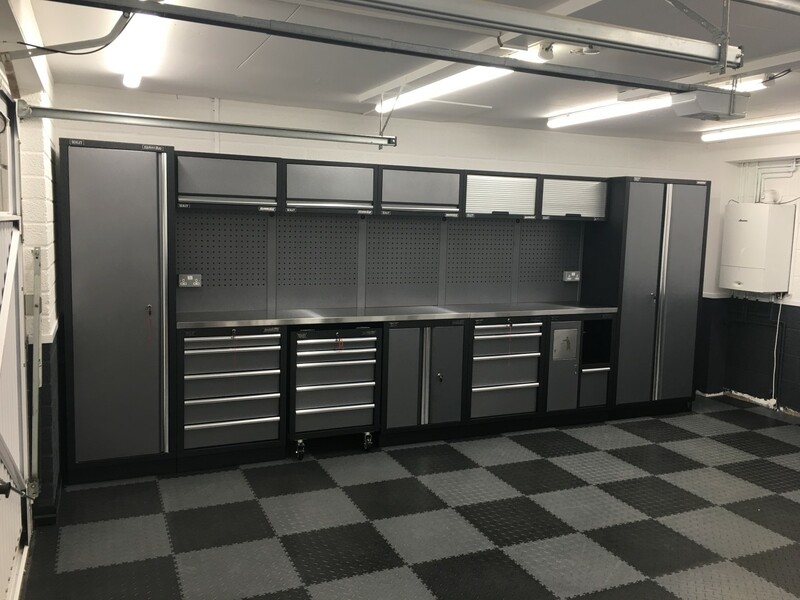 Modular 105 – a Kent based company specialising in bespoke garages and similar projects – used Mototile’s Motolock tiles in a Morgan themed garage project. And then they gave us a Tweet. More information on this project at mod105.co.uk case studies. 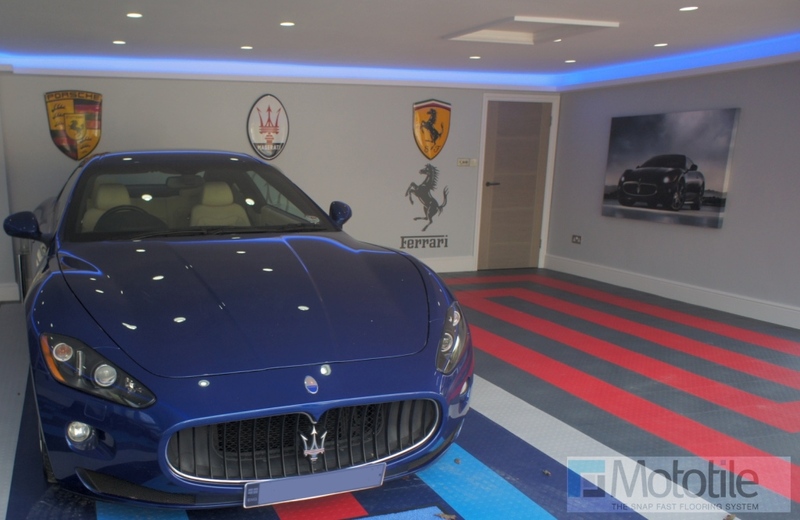 Blue and Light Grey, Diamondplate pattern, Motolock tiles were used for the floor. easy to pack away again . 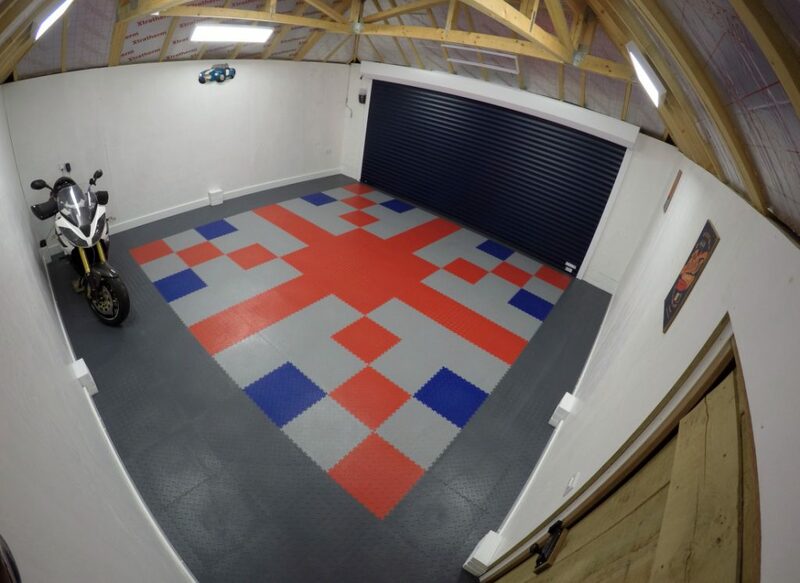 Niche Vehicle Network created this large, patriotic floor. 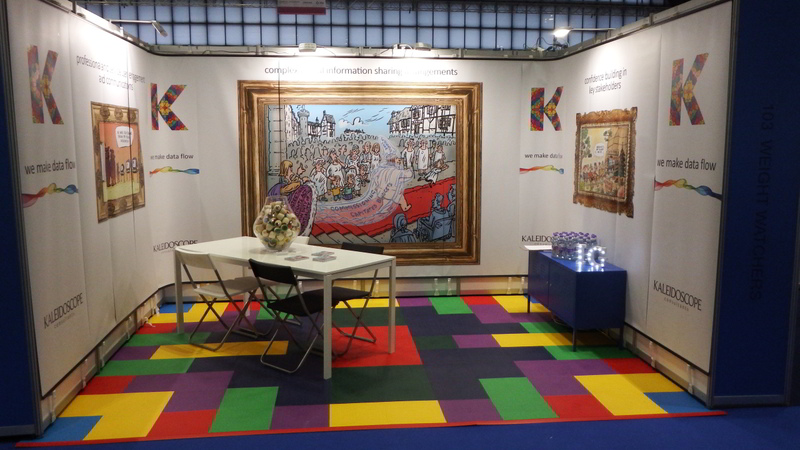 And Kalidoscope Consultants came up with a truly inspired design to showcase their company – possibly using a different pattern each time the floor is laid! People loved our stand and said it was the best in the show! If you want to experiment with floor layout colours / ideas and create similar floors try our easy to use seamless tile floor layout designer. 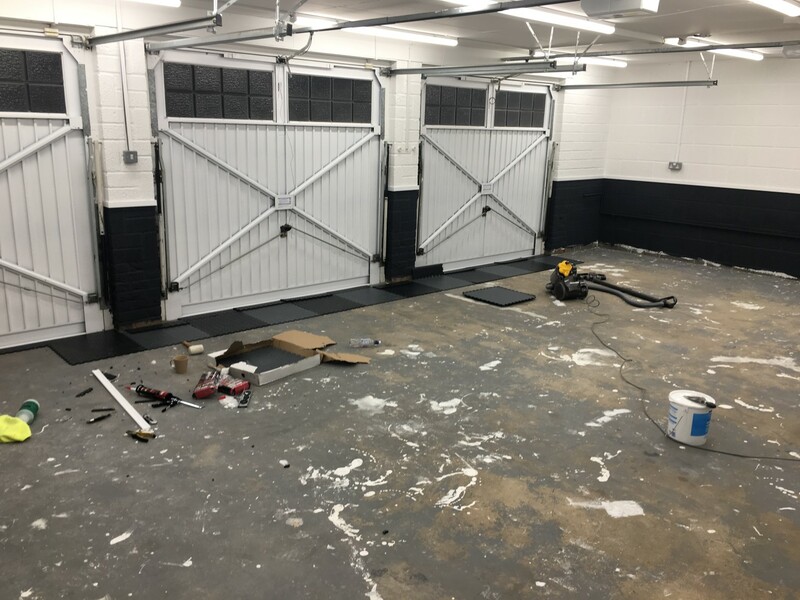 Windrush Car Storage sent us a nice time-lapse video of a (previously painted) Detailing Bay floor being upgraded. Thought you may like this, very pleased so far with flooring. 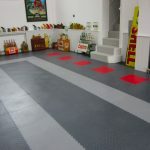 The new floor used Grey Recycled PVC materials MotoLock tiles and yellow MotoLock edge tiles (in new PVC). 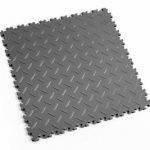 The recycled PVC tiles are manufactured to the same high standards as the new PVC materials tiles – they will take the same loads etc.- but are only available in Black or Grey and in Diamondplate or Cointop face patterns. 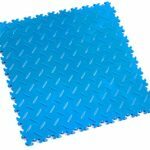 However, new and recycled PVC materials MotoLock tiles will fit together as they have identical dimensions and interlock design. The new PVC colours are shown below. 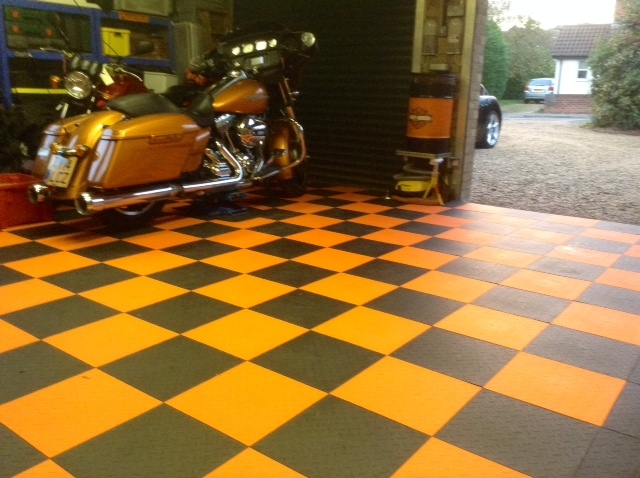 Co-ordinated Colours for Harley and Garage Floor. 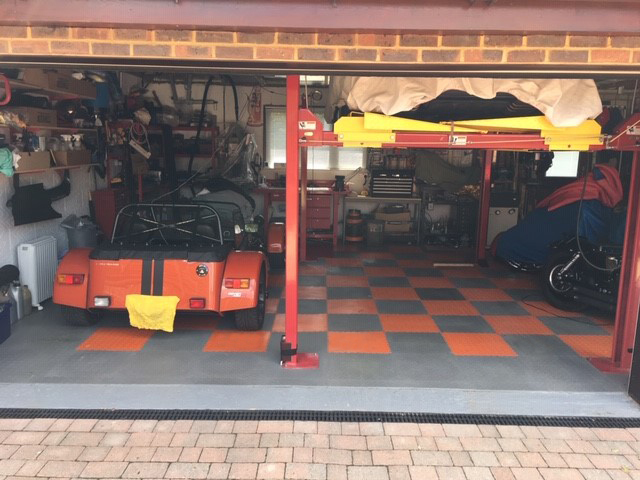 Here is a customer photo of their Carbon Black and Gulf Orange chequered pattern garage floor using Mototile Seamless Interlocking Floor Tiles. Looks fantastic with the Harley. 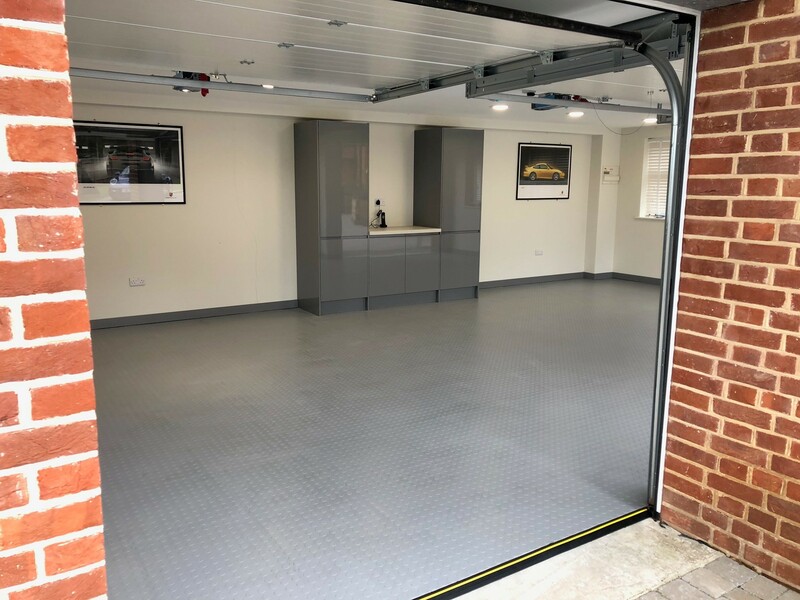 The three Mototile tile ranges, Seamless, MotoLock and MotoMat are now on display at a smart new showroom near Fareham in Hampshire. 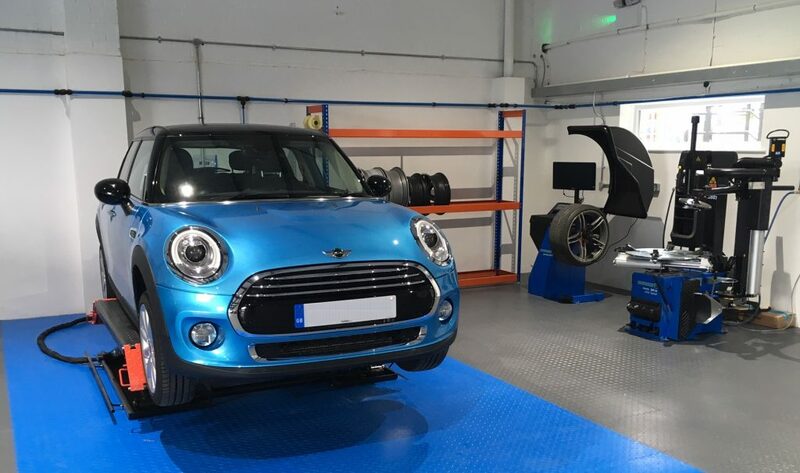 We’re open Monday – Friday, 9am – 5pm and Saturday by appointment and just 5 minutes from Junction 9 of the M27. Autosport International at the NEC. 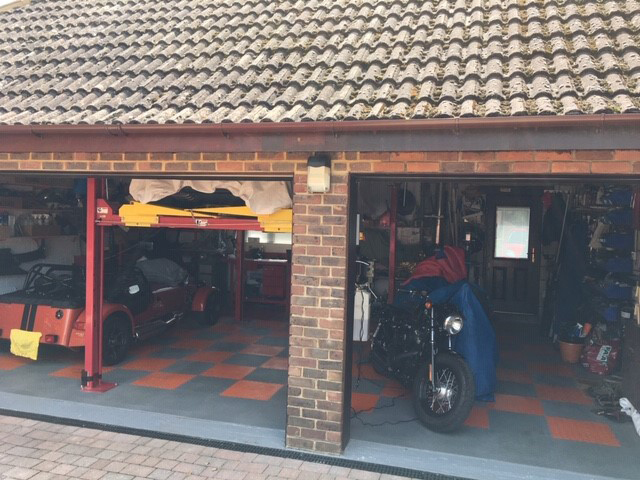 You will also find us at the Goodwood Breakfast Club, which runs on the first Sunday of every month from March through to November. Check this blog regularly, search for ‘Mototile’ on social media or visit mototile.com for details of events we’re attending. For more information / book a visit call: 01329 841 416 (M-F 8am to 5pm). Recycled Materials Interlocking Floor Tiles. 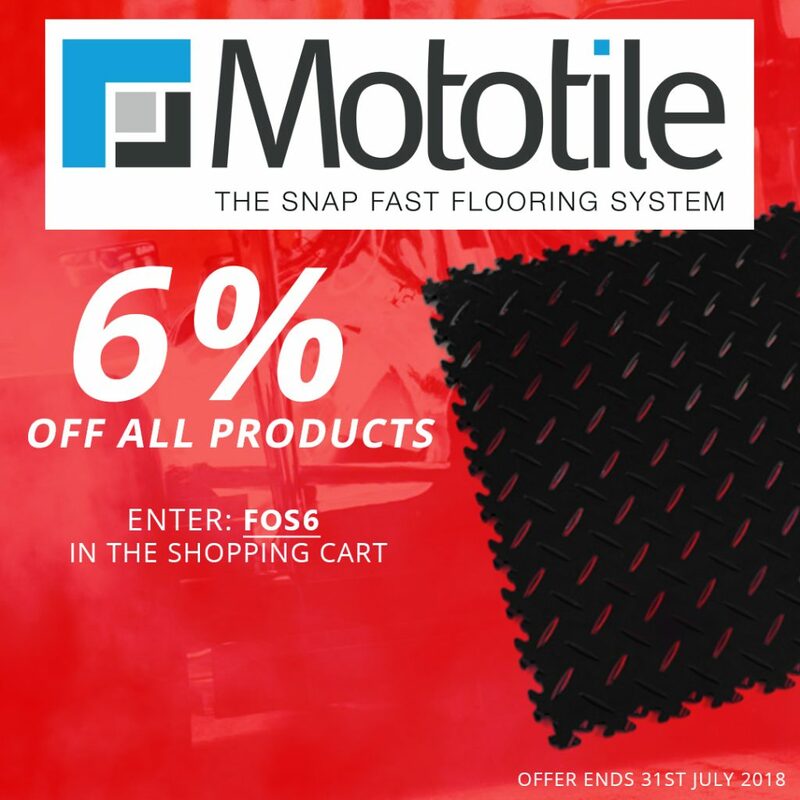 Mototile now offers three interlocking floor tiles – two in black and one in grey – manufactured from recycled PVC materials. The MotoMat recycled tile is UK sourced and has dimensions 500 x 500 x 12 mm (14mm including the pattern height). 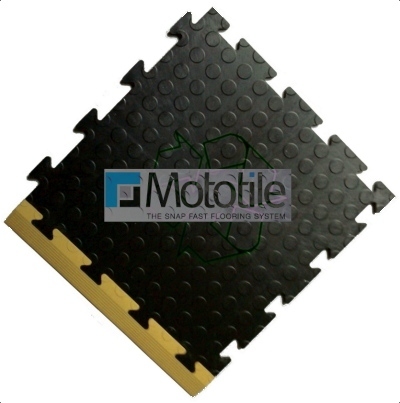 Available in black only MotoMat has optional black or yellow edging ramps. 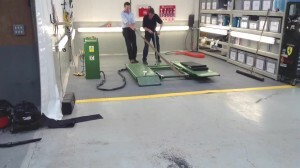 The black ramps have the further option of being new or recycled materials. Yellow ramps are new PVC. 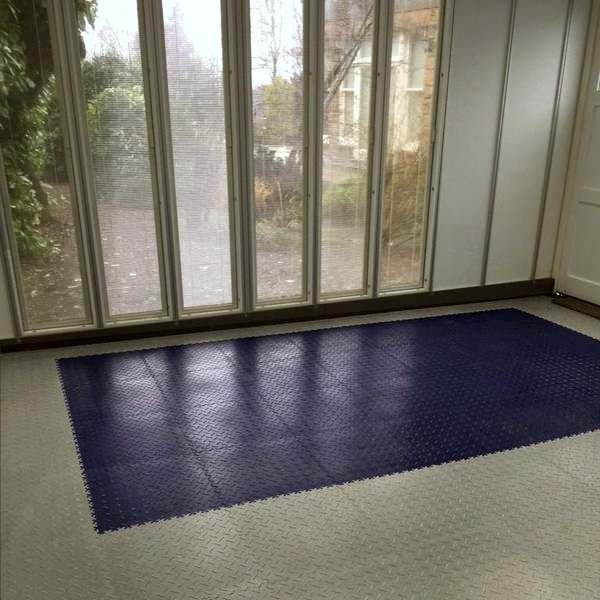 As well as having the usual interlocking tile benefits this tile can be used in standing water. 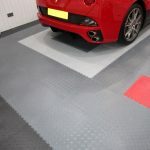 Cost, at time of posting, is £3.75 per tile/ £15 sq m / (ex vat). 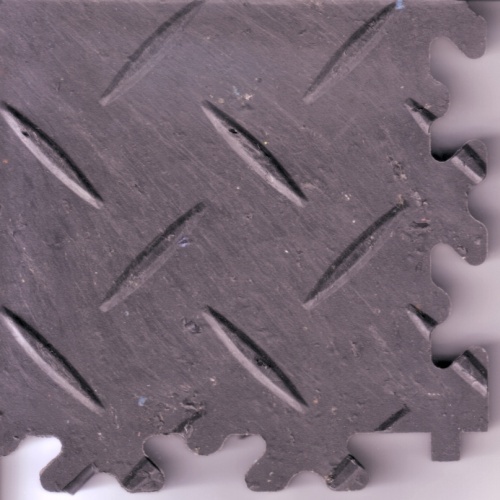 The other recycled materials tile is MotoLock, the extra heavy duty tile, suitable for warehouse flooring and similar high traffic operations. This is EU sourced. Tiles are 510 x 510 x 7mm and available in Black or Dark Grey. The close-up below shows the Dark Grey recycled tile. 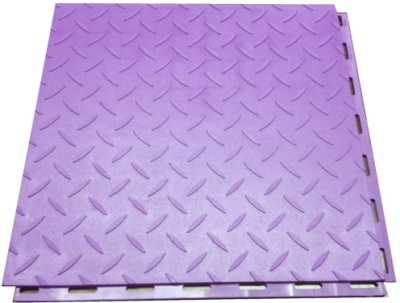 These tiles are also available in new materials at £5.85 per tile and £2.95 per ramp (ex vat). People spoke. We listened. 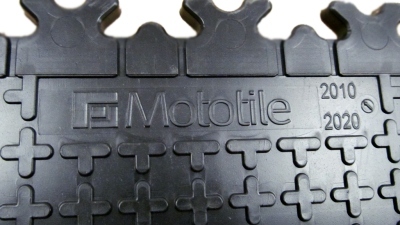 Mototile is introducing a very tough interlocking tile. Trade shows visitors asked us about really hard wearing tiles for workshops and warehouse uses. 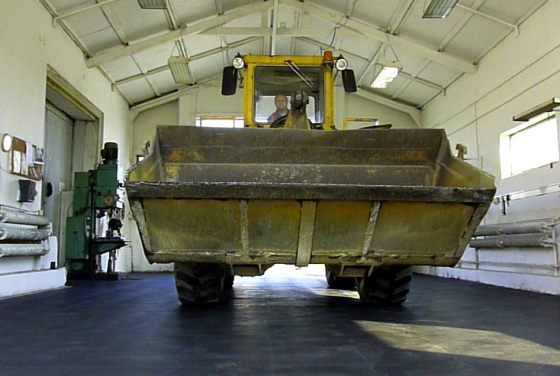 Some needed a floor that could take constant forklift action. 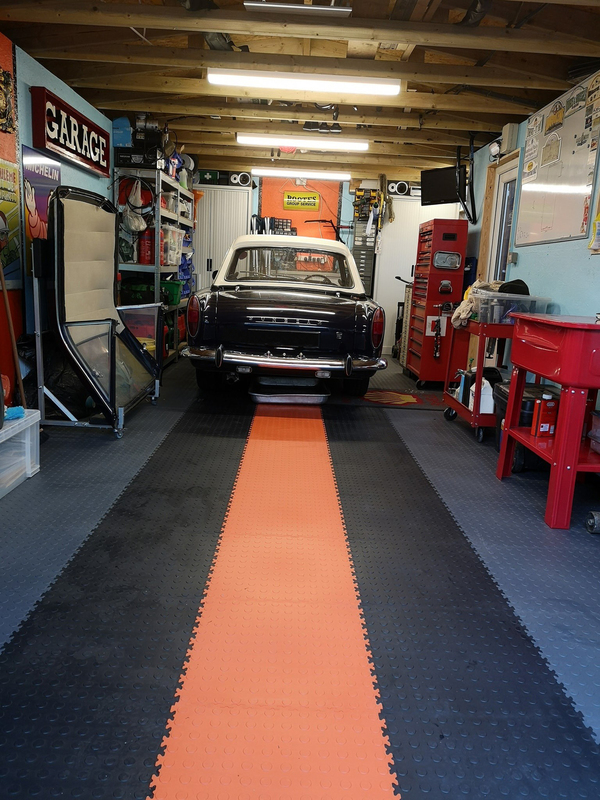 Some wanted a tough, non-slip, anti-fatigue floor to cover a large floor area without breaking the bank. 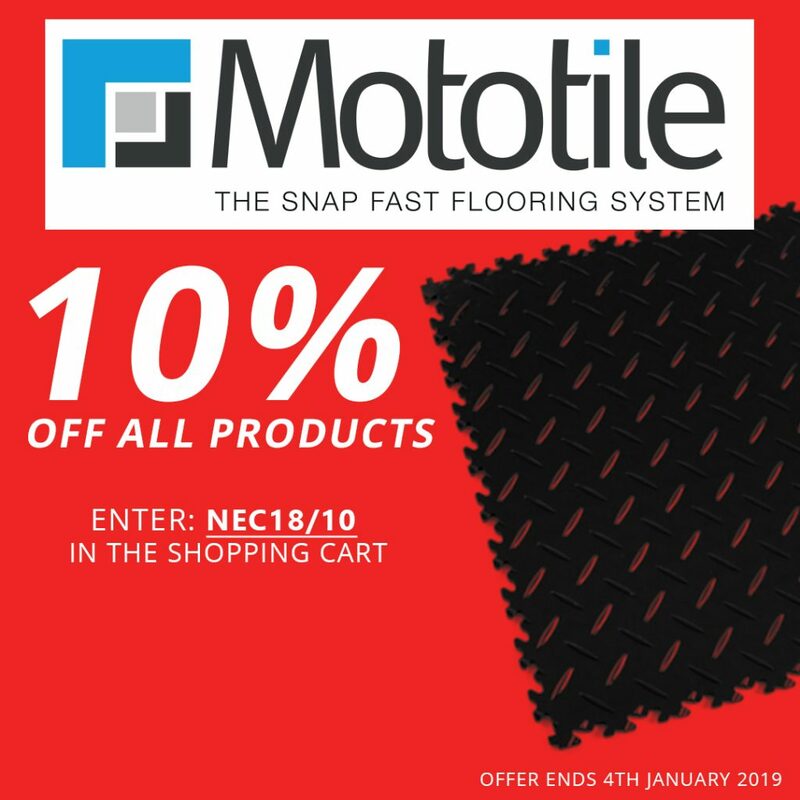 Meet MotoLock – the extra heavy duty interlocking tile, 510 x510 x 7mm in Diamond Plate finish. Available from stock in Black, Dark Grey and Light Grey or in a range of colours to order. Recycled PVC versions available in Black and Dark Grey. Matching edge ramps available as above. 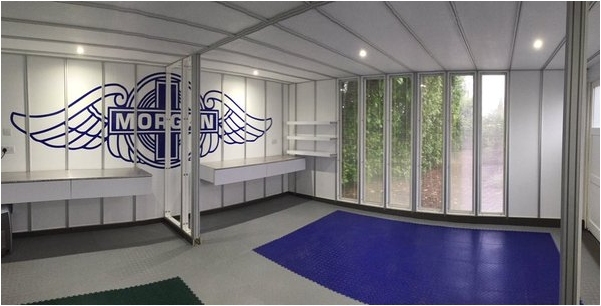 Tiles feature the Air Flow design on the reverse side to prevent moisture trapping. 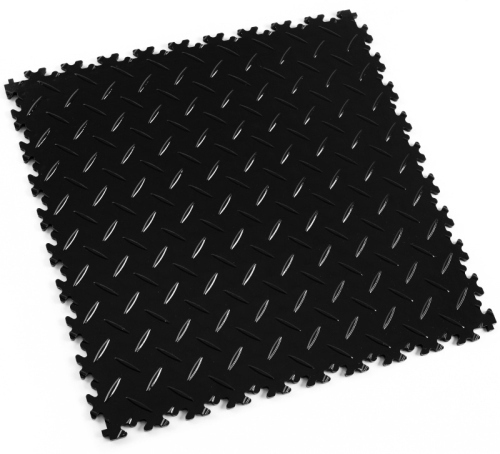 A Diamond-Plate pattern has been added to the original Coin-Top Mototile Seamless Tile range. Both face patterns are available in all colours, including the newest additions reported in the previous post. Dimensions and interlock mechanisms are identical for coin or diamond styles and the existing edge ramps fit either coin or diamond tile faces. 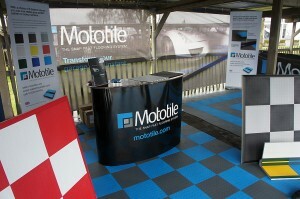 Mototile will be exhibiting at the Goodwood Breakfast Club again this year. 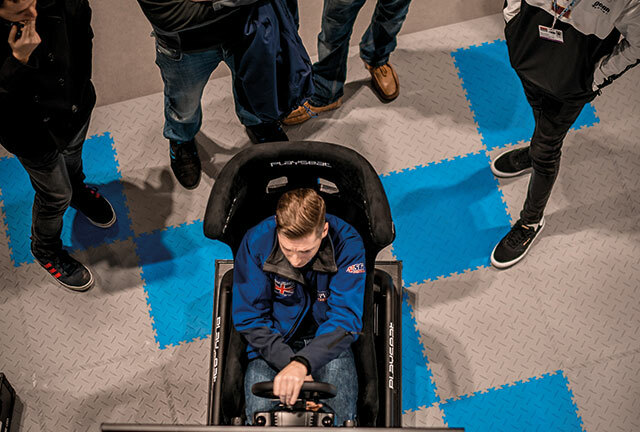 The full range of tiles, ramps and skirting will be on display so you can see the quality of the flooring and how it fits together. 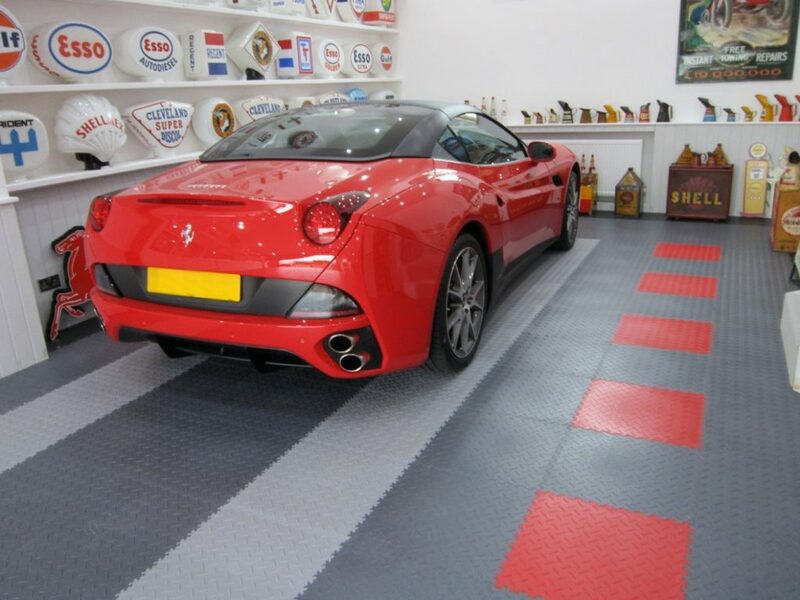 Here’s a picture from Breakfast Club 2012, where we used our garage tiles as portable exhibition flooring. Look us up at the following Breakfast Clubs this year. The best of top-down motoring in the Spring sunshine. The ultimate high-performance machines – cars and bikes, with a nod to 50 years of McLaren and the Porsche 911. See us at the 20th anniversary Festival of Speed. Pre-1966 vehicles, celebrating the golden era of Goodwood Motor Circuit, with a nod to 100 years of Aston Martin. Italy’s finest cars and motorcycles, with a nod to the 50th anniversary of the exciting Lamborghini marque. 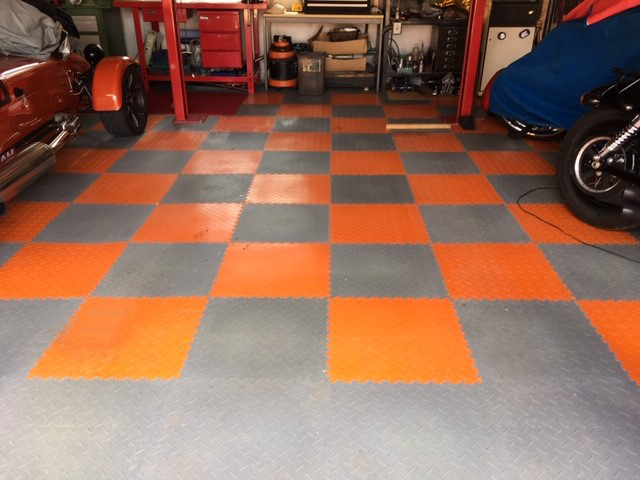 I’ve had my grey and orange check floor down for probably 2 years now it is awesome! 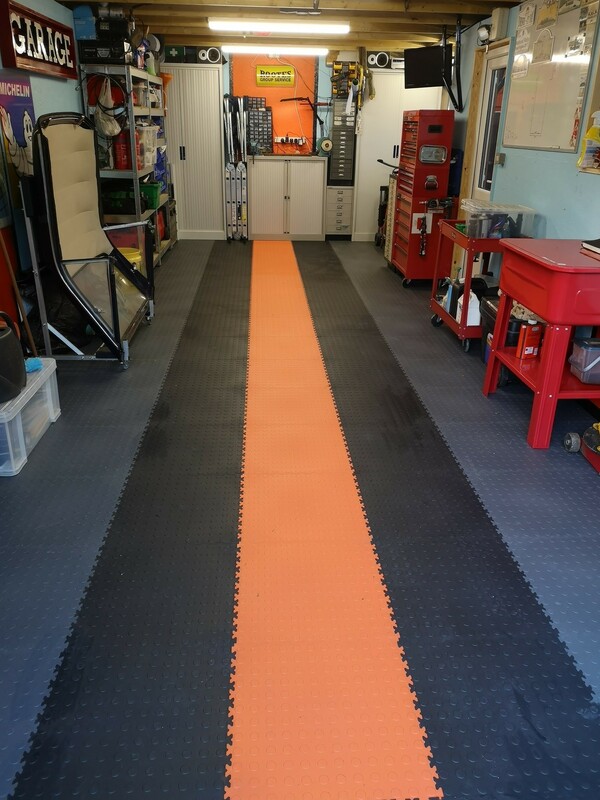 The floor is easy to keep clean, the floor is warm, nice and grippy and does an excellent job of minimising dust. The floor is pretty resilient too, I’ve dropped stuff (and stuff that may have shattered on hard floor survived! ), I park motorcycles on it also and stands don’t mark the floor. 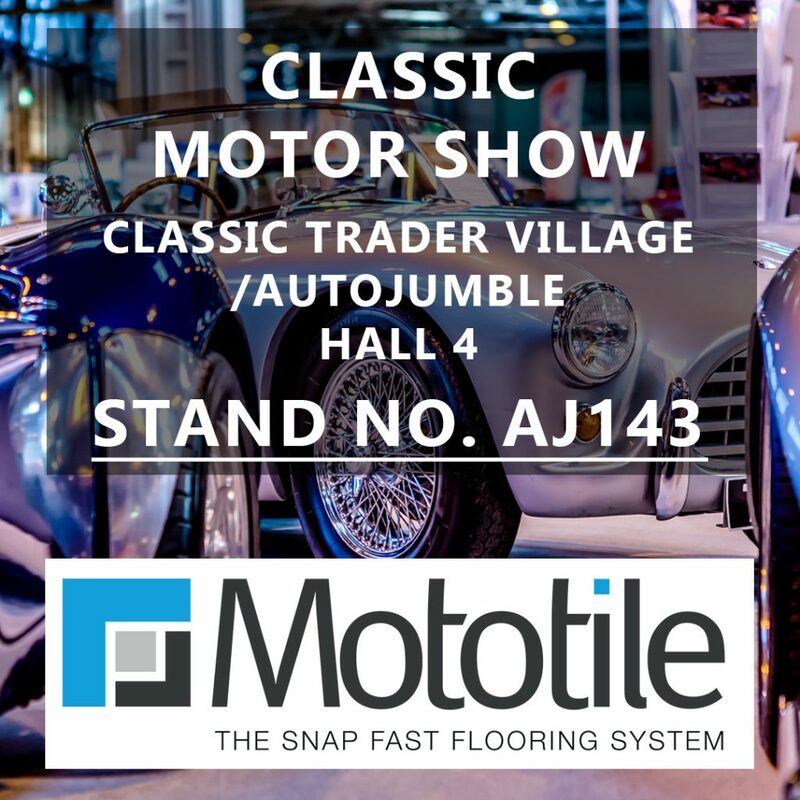 Come and see us on Stand number AJ143 at the Classic Motor Show at the NEC in Birmingham (Friday 9th – Sunday 11th November 2018). For all your flooring needs – Interlocking tiles for garages, workshops, stores, shops, offices, gyms, utility rooms and more. 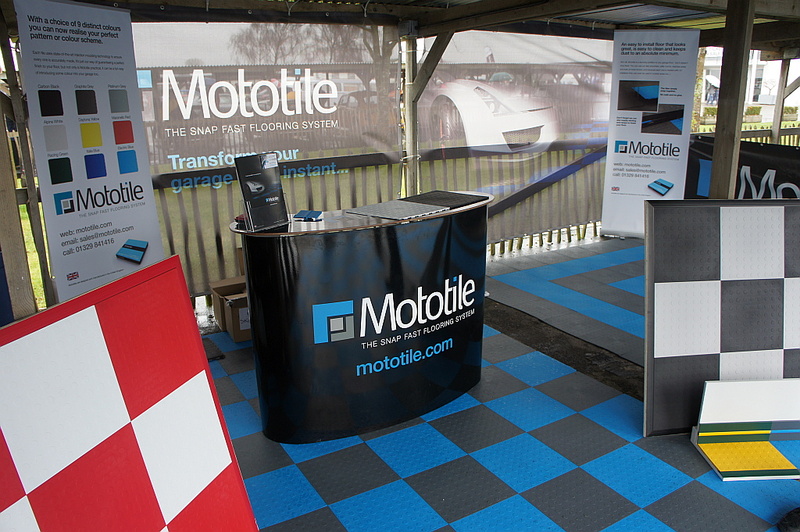 Come and see us at the festival of speed Stand 125 – Goodwood 12th – 15th July.